Get in the spirit! The spirit of profit making that is! With a variety of selections in our wine displays, you are sure to find what you are looking for. 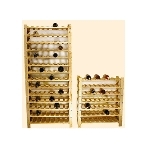 Offer up the finest spirits in high style with the latest in wine racks, cabinets, boxes, and more. As sales increase from your usage of these various wine displays, you will find yourself tipsy from the sweet taste of success. Wine racks take the ordinary out of extraordinary. 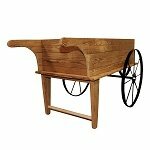 You are sure to find your match whether you are searching for a stunning countertop display or a stand-alone wine rack. No matter what selection you go with, know that each rack is designed to hold your wine bottles securely, increasing the safety of your product. 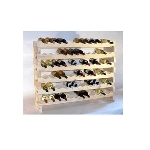 Add style when you advertise bottle displays on an acrylic wine rack. Constructed of durable materials, this clear acrylic stand can be used on display counters or at home for an updated decor appeal. 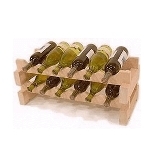 Wine towers and cellar racks are a creative way to display your bottles in your store. 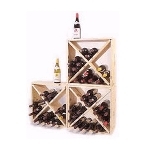 Ranging from wooden racks that hold 12 up to 72 bottles at a time. 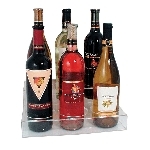 Get creative with your display today by choosing from a variety of towers, racks, and wine carts. Wine cubes made of solid pine wood adds a rustic charm to your delicious cocktail additions. Perfect for pairing with cheese and cracker accessories. Add an artistic flair to your vineyards specialty shop by advertising your home brewed bottle display on a barrel shaped wine holder for your counters or adding a wall mounted wrought iron wine display. Our racks are designed to attract attention, you can't go wrong when selecting from our choice of retail displays. Are you searching for the gift that’s just right? Natural wood wine gift boxes are an ideal way to share your favorite spirits with family and friends. 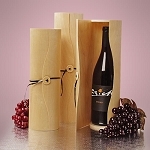 Cylinder shaped gift boxes come in various sizes, so you can give the perfect sized liquor bottle. 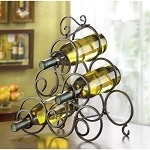 The spiral wine rack holds about six glass vessels and adds a unique feel to the decor. 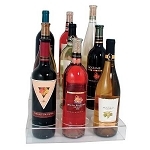 Wall mount wine displays are also a great option for gift-giving, especially for weddings. No matter if you are shopping for a gift or setting up a wine section in your store, we have the right fixture for you. Adding extra attention towards your merchandise can potentially increase profits. Invest in the future of your spirits store and shop with Candy Concepts, Inc. today!